ANZAC Cove (Turkish: Anzak Koyu) is a small cove on the Gallipoli peninsula in Turkey. It became famous as the site of World War I landing of the ANZAC (Australian and New Zealand Army Corps) on April 25 1915. The cove is a mere 600m long, bounded by the headlands of Ari Burnu to the north and Little Ari Burnu, known as Hell Spit, to the south. 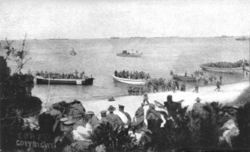 Following the landing at Anzac Cove, the beach became the main base for the Australian and New Zealand troops for the eight months of the Battle of Gallipoli. The Australian and New Zealand Army Corps was a First World War army corps of the Mediterranean Expeditionary Force that was formed in Egypt in 1915 and operated during the Battle of Gallipoli. The corps was disbanded in 1916 following the evacuation of Gallipoli. The corps is best remembered today as the source of the acronym ANZAC which has since become a term, "Anzac", for a person from Australia or New Zealand.